Find a vacation home to rent in Bytów County from our list of vacation rental properties. Campaya has over 9 vacation homes available in Bytów County, which give you the possibility to locate a unique accommodation in Bytów County which completes your check-list in search for the perfect self catering vacation apartments in Bytów County or vacation villas in Bytów County. This modern home stands on a fenced, enclosed property on the edge of a forest and near Lake Mausz. There is an open terrace with a covered barbecue. This well-tended holiday home is in Brzeźno Szlacheckie. 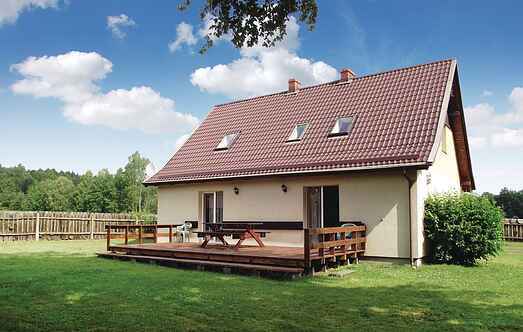 This well-tended holiday home in the town called Borowy Mlyn stands on a huge fenced ground. A lake is just 30 metres from the house. These 4 holiday homes stand on an open, shared natural ground and are about 500 metres from Lake Fiszewo. The homes are equipped with appealing furniture. This renovated holiday home offers a view of the forest and is on a slightly elevated location. The home is on an enclosed, fenced natural ground.